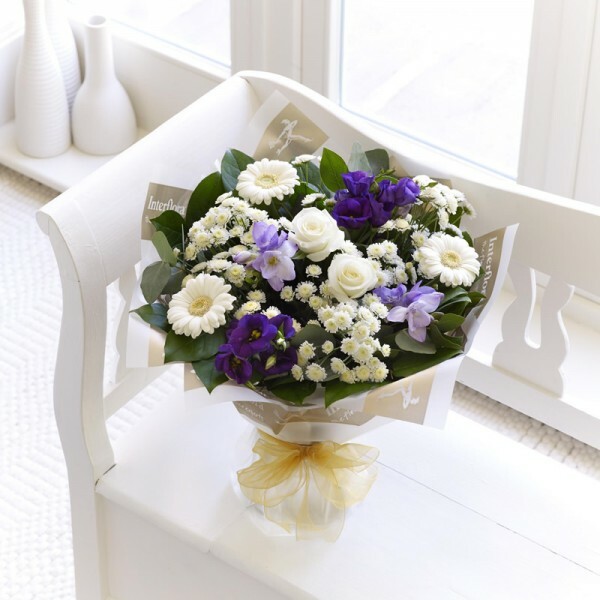 This delightful bouquet in shades of blue and white makes a beautiful gift to celebrate the birth of a baby boy. We’ve chosen a pretty selection of flowers including roses, germinis and lisianthus, with the addition of freesias giving a delicate sweet scent to this lovely gift. Featuring white large-headed roses, white germini and white spray chrysanthemums, purple lisianthus and freesia, with eucalyptus and salal, all hand-tied and finished with new baby gift wrapping. Rosebowl Flowershop is owned and managed by Ray McBain with the aim of supplying the best in floral bouquets and arrangements for all occasions.